Global Drug Integrated Polymer Fibers Market size was over USD 53.51 million in 2017 and will grow at a CAGR over 6.7% over the projected period. Drug integrated polymer fibers include biologics and pharmaceutical loaded fibers made from polylactic acid, polydioxanone, polycaprolactone, polyglycolic acid and its derivatives used in implantable medical textiles for drug delivery, orthopaedic sutures, grafts and stents and dermal applications. Combination of textile technology and medical science has resulted into a new field known as medical textiles. New areas of applications for medical textiles have been identified with development of new fibers and yarns. Medical textile fibers made are usually biodegradable, nontoxic, non-allergic, non-carcinogenic and cater to wide range of medical applications. These fibers are available in woven, knitted or braided form suitable for medical textile applications. The dimensions of the fiber can be tailored as per requirements. Pharmaceuticals and biologics loaded fibers offer high mechanical and pharmacological support from the same device unlike traditional drug delivery formats such as microspheres and nano particles making it an ideal choice in future. Also, these fibers can be extruded as co-axial fiber, multi layered with each layer containing unique drug and polymer combinations. Biologics and pharma loaded fibers offers unique advantages such as slower drug release rate than similar geometries. With advancement of wet extrusion technology these fibers are both readily implantable and can maintain positional stability. These biodegradable drug loaded fibers provide support for arteries and organs through medical dressings and as these fibers dissolve, drug is delivered to the part where the body exactly needs it. The drug integrated polymer fibers market is driven by technological developments, stringent quality control, safety regulations, rising healthcare expenditure in developing economies, aging population. However, lack of manufacturing standards possesses a restraint to the market growth. Orthopaedics was estimated to be the largest market of drug integrated polymer fibers due to known surgical procedures and rising obesity & osteoporosis problems globally. Also, the number of patients opting for implant surgeries have increased in age group of 55 years to over 80 years. Moreover, with rise in spending on healthcare facilities by developing countries of India, Malaysia, Thailand, Vietnam, the demand of orthopaedic implants is expected to rise. 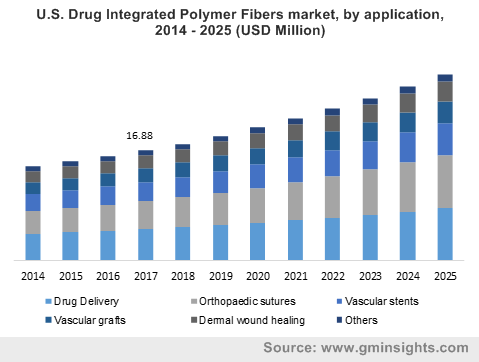 Overall, the demand of drug interated polymer fibers is estimated to grow at a health rate taking in to considertation rise in population growth globally, improvements in healthcare facilities in developing countries, rise in medical tourism facilities, innovative technologies and design, and rising purchaisng power on healthcare facilities globally. Developing countries such as China, India, Malaysia and Thailand will be potential markets for bone grafts in next 5 years as the rate of implants in these countries is less. In Europe, countries such as France and the U.K. offer healthy potential as they are less penetrated. In the Rest of World region, Brazil offers a strong potential for bone grafts as about 2 million orthpedic implants are done every year and the number is growing over the last decade. Mexico is one of the growing market and will show some traction in coming years. Innovative product designs and advancements in robotics, rise in 3D printing devices, smart implants, nanotechnology, biologics and tissue engineering will contribute to the market growth of drug integrated polymer fiber market. North America dominated the drug integrated polymer fibers market because of prevalence of obesity and osteoarthritis patients along with higher spending on medical facilities especially in U.S. At present, TissueGen Inc. and Micro Engineering Solutions Inc are the two major player in the drug integrated polymer fiber business, but it is estimated that companies operating in the biodegradable bone graft polymers space will enter the market soon. Orthopedics was the largest market for drug integrated polymer fibers in 2017 and is expected to grow at a faster rate as compared to other applications during the forecast period. 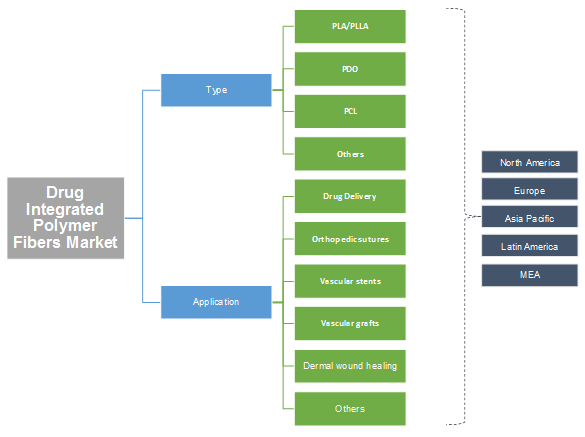 The market size of drug integrated polymers fibers which consists of PLA, PCL, PDO, PLGA, PGA used in orthopedics application was estimated at USD 16.33 million in 2017 and is expected to grow at a 7.6% CAGR annually. Aging population is the major driver for orthopaedic sutures applications. Drug delivery is also one of the fastest growing application for drug integrated polymer fibers, which is estimated to grow at a healthy CAGR during the forecast period. The report includes market analysis of different types of biodegradable fibers such as polylactic acid, polydioxanone, polycaprolactone, polyglycolic acid, poly(lactic-co-glycolic acid) and other copolymers used in different implantable medical applications. Polylactic acid and its derivatives accounted for the largest share in the drug integrated polymer fibers market driven by stable biodegradability and biocompatibility of this materials. PLA accounted for almost 48% of the total market and was estimated at USD 25.48 million in 2017 growing at a CAGR of 6.7% till the forecast period. Polydioxanone was the second largest market of drug integrated polymer fibers in 2017 accounting for almost 18% of the market share. Geographically, North America is estimated to be the largest market of drug integrated polymer fibers market accounting for almost 55% share in 2017. Rise in old population and increase in lifestyle diseases such as obesity and others will help maintain North America retain its share till forecast period. Europe drug integrated polymer fibers market size was more than USD 14.08 million by 2017 and is estimated to grow at a steady rate. Rising demand and awareness from developing countries particularly Eastern Europe will fuel the growth of drug integrated polymer fibers. At present only TissueGen Inc and Micro Engineering Solutions Inc are leading manufacturers of dug loaded fibers globally. These fibers are further sold to compounders and converters across globe for catering to different applications. At present majority of demand of these fibers is in inhouse laboratories, R&D centers, universities. Drug integrated polymers fibers are generally made from biodegradable and biocompatible materials such as poly lactic acid and its derivatives such as PLLA, polydioxanone, polycaprolactone, polyglycolic acid, poly(lactic-co-glycolic acid) and other copolymers. These fibers also called as pharmaceutical fibers and can be loaded with variety of drugs. These fibers are generally available in woven, knitted or braided form for a medical textile device. These fibers find wide applications in orthopedics, drug delivery, vascular grafts and stents along with dermal healing.